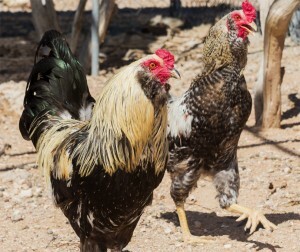 These handsome roosters are ready for adoption. $20.00 each OBO. Our sanctuary has a continuous intake of “barnyard” residents, including chickens, ducks and geese. Several of these have been found in Tucson’s public parks and left to fend for themselves. Hand-raised domestic animals find life in the “wild” very inhospitable. Unfortunately, many do not survive. Thank you to the kindhearted folks that make an effort to rescue these creatures and work with our sanctuary to re-home them. Visits to our Center are by appointment only.